People of Detroit, sorry about the Tigers. In other news, meet your new auxiliary. 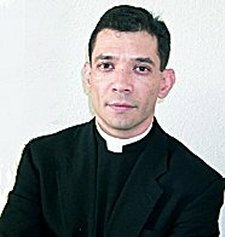 Earlier this morning -- in the first American appointment to be announced on a Saturday since God only knows when -- the Pope named Msgr Daniel Flores, rector of the cathedral of his native diocese of Corpus Christi and vice-rector of St Mary's Seminary in Houston, as auxiliary bishop to Cardinal Adam Maida of Detroit. Born in August, 1961, the 45 year-old bishop-elect becomes the US hierarchy's youngest member. Ordained for Corpus Christi in 1988, Flores was immediately placed on the fast track by then-Bishop Rene Gracida, who the new bishop served as his personal secretary, parochial vicar of Corpus Christi Cathedral, vice-chancellor and episcopal master of ceremonies. After five years as the diocese's vocation director, he was sent to Rome, where he earned his license and doctorate in theology from the Angelicum. Returning home, the bishop-elect was named chancellor of the diocese while serving as a professor of theology at the University of St Thomas in Houston and St Mary's, where he was named vice-rector in 2002. Named earlier this year as rector of Corpus Christi Cathedral, he speaks Spanish, Italian, and Latin in addition to English. The timing is more than notable; Cardinal Maida reached the mandatory retirement age of 75 in March, 2005, and Detroit has been abuzz with anticipation not for the naming of a new auxiliary, but of its new archbishop. (Hot name in the mix: Archbishop Edwin O'Brien of the Military Services.) That the archdiocese's first-ever Latino bishop has been tapped at what seemed to be the tail-end of Maida's tenure is quite the surprise. Per the provisions of the canons, Bishop-elect Flores must be ordained to the episcopacy and take office in the Motor City within four months of this morning's appointment. In the exercise of your pastoral ministry, you have had to respond in recent years to many heart-rending cases of sexual abuse of minors. These are all the more tragic when the abuser is a cleric. The wounds caused by such acts run deep, and it is an urgent task to rebuild confidence and trust where these have been damaged. In your continuing efforts to deal effectively with this problem, it is important to establish the truth of what happened in the past, to take whatever steps are necessary to prevent it from occurring again, to ensure that the principles of justice are fully respected and, above all, to bring healing to the victims and to all those affected by these egregious crimes. In this way, the Church in Ireland will grow stronger and be ever more capable of giving witness to the redemptive power of the Cross of Christ. I pray that by the grace of the Holy Spirit, this time of purification will enable all God’s people in Ireland to "maintain and perfect in their lives that holiness which they have received from God" (Lumen Gentium, 40). The fine work and selfless dedication of the great majority of priests and religious in Ireland should not be obscured by the transgressions of some of their brethren. I am certain that the people understand this, and continue to regard their clergy with affection and esteem. Encourage your priests always to seek spiritual renewal and to discover afresh the joy of ministering to their flocks within the great family of the Church. At one time, Ireland was blessed with such an abundance of priestly and religious vocations that much of the world was able to benefit from their apostolic labours. In recent years, though, the number of vocations has fallen sharply. How urgent it is, then, to heed the Lord’s words: "The harvest is plentiful, but the labourers are few. Pray, therefore, the Lord of the harvest to send out labourers into his harvest" (Mt 9:37-38). I am pleased to learn that many of your dioceses have adopted the practice of silent prayer for vocations before the Blessed Sacrament. This should be warmly encouraged. Yet above all, it falls to you, the Bishops, and to your clergy to offer young people an inspiring and attractive vision of the ordained priesthood. Our prayer for vocations "must lead to action so that from our praying heart a spark of our joy in God and in the Gospel may arise, enkindling in the hearts of others a readiness to say ‘yes’" (Address to Priests and Permanent Deacons, Freising, 14 September 2006). Even if Christian commitment is considered unfashionable in some circles, there is a real spiritual hunger and a generous desire to serve others among the young people of Ireland. A vocation to the priesthood or the religious life offers an opportunity to respond to this desire in a way that brings deep joy and personal fulfilment. SVILUPPO: Statement from Detroit; ordination scheduled for 29 November.... Flores to have "special focus on Hispanic concerns" in the archdiocese, Maida "delighted" that new auxiliary "is now a part of our team" (read: that Szoka was able to pull one more outta the hat). Bishop Carmody of Corpus Christi: Flores is a "true servant-priest and leader, someone who is kind, pastoral, intelligent, and highly-organized, someone who relates well to everyone... the young, the middle-aged, and the elderly"; new bishop "humbled": "I am a priest of Detroit now, by the will of the Holy Father, and I look forward to learning and serving in my new home." ...all well and good, but can he help free Maida & Co. from The $40 Million Hole?